(Miami, OK) – The 2019 Rodeo Miami event, presented by Vance Dodge Chrysler Jeep Ram, will take place on Friday, May 3rd and Saturday, May 4th at the Miami Fairgrounds. This event has been recognized by the American Cowboy Rodeo Association (ACRA) as the Rodeo of the Year for the past nine consecutive years (2010-2018). With more than four hundred contestants anticipated, the event continues to draw fans from across the four state regions and serves as one of the largest annual events held in Miami, Oklahoma. Rodeo tickets, sponsored by Quapaw Casino, are on sale and can be purchased from Queen, Teen or Sweetheart contestants, at the Miami CVB Visitor Center (111 N. Main) or at Westco Home Furnishings locations in Miami, Vinita, Grove, Neosho, MO and Columbus, KS. Advanced tickets are available and are $10 nightly for adults or $15 for both nights. At the gate, a one-day ticket will be sold for $12 for adults and the two-day ticket will be $20. Tickets for kids (4-10) are $5 nightly in advance and at the gate. Ages 3 and under are free. “This event continues to grow, and we are thrilled to bring back a full line-up of family fun for the region” stated Bob Carder, Chairman of Rodeo Miami. “Rodeo Miami is one of the top ACRA rodeos in the area and we look forward to another great event. This event is full of entertainment for all ages” Carder added. 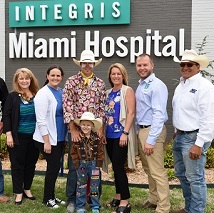 Rodeo festivities begin in Miami on Friday, May 3rd with INTEGRIS Miami Hospital Kids Night. Gates at the Miami Fairgrounds will open at 5 p.m. nightly. Kids’ activities will start at 6 p.m. and will include the NEO Kids Zone where kids will be taught how to rope. Back by popular demand is the Jumbotron video screen, sponsored by Buffalo Run Casino that will provide additional enjoyment for fans of all ages. Mutton Bustin, a favorite crowd pleaser, will take place on both nights of the rodeo. Kids interested in entering must be registered at the announcers’ stand each night by 6 p.m. Participation is on a first-come, first-serve basis and participants must weigh sixty pounds or less. Cost to enter is $20. Each night, the winner will receive a Rodeo Miami buckle. The rodeo performance will begin nightly at 7:30 p.m. Miss Rodeo Miami Queen, Teen and Little Miss Rodeo Miami Sweetheart will be crowned on Friday, May 3rd. Rodeo Clown Justin “Rumpshaker” Rumford will be a part of the performance both nights. Rodeo entertainment is being provided by High Winds Casino. Pink Night at Rodeo Miami will be on Saturday, May 4th. Rodeo fans are encouraged to wear pink on Saturday to help in supporting the “tough enough to wear pink” theme. Pink bracelets will be sold and special activities will take place to help support cancer programs in our region. Rodeo fans will have the opportunity to donate towards the project during the Saturday night performance. Concessions will be available each night and during slack. Vendors spots are still available by calling Lauren Hart at the Miami CVB at 918-542-4435. For more information about Rodeo Miami, call the CVB or follow Rodeo Miami on Facebook for event updates.